I know I'm not the only one agonized about what is happening to the world today by your actions, and you should not be causing fears on the people. Democracy has given you the right to act and to deliver as you always promise but does not grant you the certificate of deceptions and fallibility. I am fully aware that, your actions and inactions are supposed to consolidate democracy and in doing so, you act like a check on the ruling government by constructively criticizing its policies, you act like security agents securing serenity in the state and you should be development oriented animals (development innovators) as Aristotle puts it. But however, your actions and inactions in today’s milieu speak otherwise. You have turn the game of politicking into a world full of drama and people have lost interest in you. I remember vividly people saying, “If you want to be wealthier in life, then, venture into politics". Really!! is that what the game signifies? You have caused people to call you names and to some extent, they believe politics is a dirty game but No, I repudiate that conviction because, it is only dirty when played or practiced by undemocratic people: By undemocratic people I mean for instance people who amass wealth out of it, people who slander and hoodwink, people who give purposeless promises and people who risk into it with corruption inclined minds. The citizens had hopes in you since Ghana gained independence in March 1957 and those hopes that they graced, those hopes that they waited for all these years (62yrs) are all wasted on empty promises. Similarly, the great citizens of Nigeria hoped more than Ghanaians yet their situations are worse of than ours. Corruption has become your friend and you embraced it with impunity to the detriment of the interest of the people. I call you “Greedy-base rebels”; you tend not fight or strive for the interest of the state but using the opportunity to promote your own selfish interests. Aristotle once said “man is a political animal and his life is only meaningful when he is striving hard and reaching out for”. This simply implies that, man can only survive in a community with others, a community where there is peace, a community where their dreams can be accomplished and such meaningful life is in the jobs, security and the happiness you politician have to provide and if at all you should strive and reach out for it, you ought to consider the larger interest of the people first and provide them accordingly. I have seen all the incredible political drama you rendered from the past to now that are still making it unachievable to see the growth of this country. 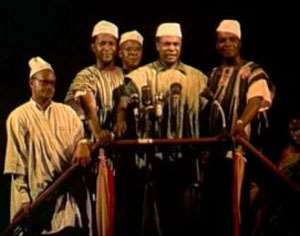 I remember the dispute between our own elites who were in the same itinerary of unburdening us from imperialism, I remember very well the tactical conflict between the CPP and the NLM in 1956 which habitually belated our quest for independence. I still remember those expectations which the good people had on Nkrumah and the CPP government till he misrepresented his powers and lost the confidence of the nationals in 1966. I remember when I first realized how truly terrible the wars in the 1972, 1979 and 1981 were. I also remembered hearing the crushing vindictive politician making scary statements like “all Die be Die” and “Boot for Boot” which are all undemocratic and would no way aggregate to consolidating the democracy of Ghana. It only makes the very people who entrusted you power feel terrorized and compunctious over empowering you. Instead of being a “Goal-oriented rebel”, you rather want to use the innocent citizens to accomplish your greedy purpose... No, you can do better than that. I remember thinking that our nation is futile and realizing the devastating truth in that fact. I remember not caring who NPP was and who was NDC or what the difference between them are. I remember realizing that there hasn't been a day when the Ghanaian state wasn't in a war over party’s interest instead of that of the nation's. I remember realizing I would be voting for the 2020 election. I remember first hearing of Donald Trump - a man who started a university, owns hundreds of buildings and corporations, appeared in Home Alone 2: I remember watching John Oliver's video of absurdity with this man. I remember hearing of the candidates who don't want women in power and who are racist. I remember the first time I heard of Bernie Sanders – and I discovered everything he stood for, and realized his age and absolute kindness. I remember first hearing that women who do not vote for fellow women cannot say they are feminists when Nana Konadu Agyeman Rawlings first ran for presidency in 2016. I remember first hearing Massachusetts's Republican Governor, Charlie Baker say he won't vote for Trump because of the perception he has about Trump and his policies. I remember hearing how scary the 2016 entire election process in Ghana truly was untill the supreme court ruling was truly followed showcasing the democratic maturity of the nation yet, I equally remember being scared of living in my own country for the roles you politicians played in the Ayewaso West Wuogon by-election, the KNUST impasse and now the University of education, Winneba issues. You always have an interest to accomplish while neglecting the public interest. You fight among yourselves in parliament and turn parliament into a place of party-based debates, making orders and motions which only reflect party's instead of the nation's interest and giving MPs the nandate to walk out of parliament at will. You politicians have created institutions and made them dormant and useless in living up to their expectations. For instance the Special Prosecutor’s office was created to fight corruption. The citizens had hope that corruption has been made a crime by the velocity at which the special prosecutor assumes office yet under his watch, we saw the corrupt practices in the Ghana Football Association (GFA) and in our Mining sector. Why was these institutions created? Well, Obama once said “Before we can develop, we must create institutions and make them work". My encounter with an 18 year-old college student whose first time voting revealed that, “I am in absolute disbelief". Politics, you are phenomenal. Not in the best sense you would visualize, rather, in an intellect where you truly need to get your statute together. Also, a 19 year-old college lady I encountered feels so scared she voted for the wrong candidate. Politicians, why are you tormenting the citizens? With this, Growing up, I have studied the ways of the American government all my life and I have come to realization that the ways of Ghanaian politics is not organic, it's hell. I considered majoring in political science and it has exposed me to the vindictive nature of bad politics and how scientific it should be practiced. But the innocent and promising ones who are currently running to be future leaders, I don't know if I wish for any of you to take that oath in 2020 because you have been soaked with the same perception of the game and might not enjoy full legitimacy from the populace. NPP? NDC? Socialist? Or Liberalist Who cares. Do you care for the nation? Do you care for its people? And do you wish to help the world? Wonderful. Then start operating like it. Those were the days when few patriots choose to take a few minutes of absolute distinction and prominence with basically the entire country watching and speak about matters that matter to the nation. It took few people to stand up and to be respectful, modest, and selfless to make a point. . Now let us as citizens whether those points are made. Not entirely, but they started something. Again. Again? Oh, you already know about the points being asked in this time of revolution? You know your answers and stances? And it obvious nothing has changed. If women were first allowed to vote 1920 because of the 19th Amendment, then why are women now considered for the just Navy Seals? Why are women still fighting for respect? Why was a woman humiliated on national television during a presidential debate? Why must I be writing my frustration to politics via an online publication? Shouldn't these questions I am raising already be answered? Shouldn't I, being the 18 year-old voter who always risk my precious life to entrust you power be happy and unperturbed? Shouldn't my biggest fear graduating soon from the university soon rather being curious of whether I will be living happily and safely in my own country full of jobs come this time 365 days from now? To the politicians of today..., do you remember; when you first started working for your degrees? When you were in my very pace? Remember how excited and ambitious you were? What with your own views, probably decent grades, true friends, and simple happiness? Now look at you - you are doing everything you can to get your way. I bet an I know that each one of you pulled an all-nighter, at least once in college, because you got caught up being busy with friends, family, and helping others that you skipped out on your studies until the last minute. Do you remember those days? Please, do away with the money-inclined believe in the game and fight for the growth of the country. I know it might seem like a different time, but don't you remember a time without war, without absolute, undying fear everywhere you went? I know you remember the moment you fell in love with political science and decided to continue in its path. I know you remember the time when you first loved and cared for what you were doing, and planned on doing it with your life. I know you remember a time when you were determined to help as many people as you possibly could. And I know you have had a moment in time when you realized the road you are now on. I Also know you have questioned your actions and have committed to things you are not proud of. So, why continue with all of it? Why continue causing harm, discrepancy, confusion, and fear for everyone you are trying to help? When will we be honest, naive, and communicable again? When will my own government be trustworthy, manageable, and fulfilling? Politicians, if you understand one thing, every one single thing in this, the next thing is to understand that the people of Ghana and other countries are trying to understand your motives, but we, the people, cannot. So kindly sacrifice your goals for selfish desires and help us, we the people who legitimized your actions. You have already surpassed your original ideologies, dreams, goals, and ambitions, and now, please, help the citizens reach theirs. I am a researcher, policy analyst, Motivator, and a peer mentor. History Revisited; Renaming Of Universities In Ghana is A Bad Move!! State Of Affairs; Ghana's Security, Are Citizens Protected?